A queue of cars was waiting at the lights. The young woman asked a passerby for a light for her cigarette. Seen in that light, your suggestion seems quite reasonable. Sean was wearing a light blue shirt. The book was a light read—perfect for taking on holiday. Sabina prepared a light supper. John had to drive home after the party, so he only had one light beer. Hanukkah (also spelled Chanukah or Hanukah) is a Jewish celebration that is also known as the Feast or Festival of Lights. Hanukkah begins on the twenty-fifth day of Kislev (the ninth month of the Hebrew ecclesiastical year) and is observed for eight nights and days with the kindling (lighting) of lights on a menorah (a candle holder with nine branches, like the one in the picture above). One of the branches of the menorah is usually above the rest. This branch holds the candle that is used to light the others (this light is called a shamash). The festival is observed by lighting one of the other eight candles on each night of Hanukkah, until all eight are alight. This is done to commemorate the rededication of the Holy Temple in Jerusalem, in 165 BCE, following two years when Judaism had been banned by King Antiochus of Syria (at the time, Judea was part of the Seleucid Empire of Syria). When the temple was rededicated, oil was needed for the menorah in the temple, which had to burn throughout the night, every night. However, the oil had to be pure olive oil and had to bear the seal of the high priest. Only one flask of oil meeting these requirements could be found and it contained only enough oil for one day. The menorah was lit, nonetheless, and, by a miracle, it continued to burn for eight days, which was enough time for more oil to be prepared. 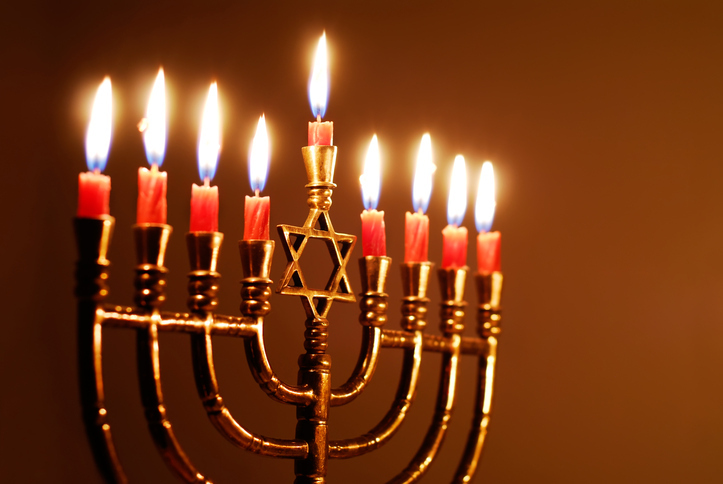 The lighting of the menorah over the eight nights of Hanukkah commemorates this miracle.